As a leading provider of neonatology services, we embrace the opportunity to celebrate the successes and achievements of our tiny neonatology patients, their strong parents and experienced clinicians. On September 17th, 2016, Winnie Palmer Hospital for Women & Babies is hosting its second annual Walk for Winnie at SeaWorld Orlando. The emotional event provides an opportunity for NICU patient families to gather together with hospital and community supporters and celebrate their infant’s journey from simply surviving to THRIVING while raising funds to support future NICU family success stories. The walk’s participants will include NICU patients, ranging in age from newborn to adult, and their family and clinical supporters. Last year’s walk hosted over 2,000 participants, including baby wearing moms and parents pushing children in strollers. The one-mile walk is designed with young families in mind and is followed by family centered activities where children, who were once tiny NICU patients, can be seen gleefully enjoying the theme park’s characters and animals and other event attractions. Event highlights include the NICU Graduate Tent, where former NICU patients receive pins, shoelaces and temporary tattoos celebrating their success, and the Dunk-A-Doc event staffed by Pediatrix-affiliated neonatologists Michael McMahan, MD, Jose Perez, MD, and Gregor Alexander, MD. There will also be a NICU ambulance available for personal tours and a fully stocked photo booth. “The annual walk is an event our practice truly looks forward to. We grow close to our patients and their families as some of them may spend as many as 4-5 months in our care. A special bond is created during that time. It means a lot to us to be able to spend a day together celebrating these thriving children while raising funds to support the critical needs of future NICU babies,” said Gregor Alexander, MD, neonatologist, Pediatrix Medical Group of Central Florida. Watch these moving videos documenting NICU babies as they leave the hospital for the very first time. The Winnie Palmer Hospital for Women & Babies is home to the Alexander Center for Neonatology, a Level III NICU that treats 1,600 critically-ill infants annually. Pediatrix Medical Group of Central Florida, an affiliate of MEDNAX, is the Center’s trusted NICU provider. Dr. Alexander has been a neonatologist for 39 years and is the Center’s namesake. He is also the founder of Walk for Winnie. “Many of today’s advancements in neonatology are made possible with the help of fundraising activities and quality improvement initiatives such as the 100,000 Babies Campaign. Together, through collaboration with NICU practices across the country, our practice improved eight common problems affecting babies in NICUs. These improvements are expected to enhance the long-term health of NICU patients,” he said. The world of neonatology has celebrated many advancements in the 35 years since Pediatrix Medical Group, a MEDNAX Company, started providing NICU services. We proudly continue supporting this journey of success into the future through our Center for Research, Education, Quality and Safety. Today, Pediatrix Medical Group of Central Florida along with other Pediatrix-affiliated neonatology practices across the country contribute to future advancements through active engagement in both neonatology and cross-specialty focused clinical trials, research initiatives and quality improvements projects. 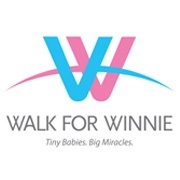 Visit the Walk for Winnie website for details on how you can show your support.